6.8.6.2 What motivates the elderly to exercise? The physiotherapy management of older adults is not a new concept however, as healthcare advances, the average age of the population increases and it is suggested that the prevalence of frailty will multiply. Subsequently, this causes further demand on the NHS; an already overstretched service. In response to this, there has been an increased drive to improve the efficiency of the management of frailty. There has been a shift of care from reactive to preventative strategies and a focus on providing early interventions to reduce costly unplanned admissions to hospital. Furthermore, from our experience on clinical placements and following discussion with expert clinicians, it became apparent to us that final year students may lack knowledge and awareness around the holistic management of frailty. Consequently, this online learning resource has been created by a group of student physiotherapists and is tailored towards final year students and newly registered physiotherapists. This has been designed as an individual resource and should take 10 hours to complete. As mentioned above, this a 10-hour interactive learning resource. This means you will be working through various learning materials, including multimedia resources, learning tasks and a case study. These have been tailored for you in order to facilitate optimal deep learning whilst considering different learning styles. These time frames are intended as a guide and you should take adequate rest as required. Furthermore, this wiki has been designed to allow you to work through it in your own time and you are not required to complete it in one sitting. as well as previous experiences and new learning. Consider using a reflective model of your choice when doing this. All information related to the case study will be presented here. believe is the most essential evidence in relation to our topic. The sections below will outline the aims and learning outcomes of this resource. These have been created using the appropriate levels of Bloom’s Taxonomy for final year students and newly registered physiotherapists in order facilitate a high level of thinking and learning. Provide you with an introduction to contemporary and emerging issues in the field of reducing hospital admissions in the frail elderly population and current management strategies. Analyse the emerging issue of frailty in relation to the current context of health and social care in the UK. Critically evaluate the physiotherapist's role in the holistic assessment and treatment of frail individuals to prevent hospital admission. Evaluate the skills and knowledge gained from this resource, identifying appropriate application in clinical practice. In this section we will define and contextualise the contemporary and emerging issue that is frailty, providing demographics and the current climate of health and social care. This section is in relation to learning outcome 1.
your current knowledge in relation to frailty. Please write this down as we will revisit this at the end of the learning resource. Why is it important to know about frailty? What do you think a physiotherapist’s role is in relation to frailty? How do you assess and treat a frail patient? “a biological syndrome of decreased reserve and resistance to stressors, resulting from cumulative declines across multiple physiological systems and causing vulnerability to adverse outcomes". The British Geriatrics Society (BGS) support that frailty is an age-related health state affecting multiple body systems. They describe Fried's phenotype model which concisely highlights the signs and symptoms of frailty. If an individual satisfies three out of the five criteria, they are diagnosed as being frail (Table 1). However, if one or two criteria are met, they may be deemed as being pre-frail. This can act as an early warning sign for frailty. Weight loss A drop in bodyweight of ≥10lbs/4.5kg in the past year or a drop in bodyweight of ≥5% in the past year. Weakness Measured using grip strength. A result within the lowest 20 percentiles according to gender and BMI indicates a weakness. Reduced energy/endurance Self-reported, can also be a predictor of cardiovascular disease. Slowness The lowest 20 percentile of the population according to gender and standing height, 15ft walking time. Low physical activity Based on reported activity levels translated into a kilocalories score. Again with a cut-off at the lowest 20th percentile for each gender. The phenotype model can also be used as a quick screening assessment tool for frailty. However, the Comprehensive Geriatric Assessment (CGA) is often preferred due to the multi-dimensional and holistic nature. Furthermore, in an international systematic review, it was concluded that prevalence of frailty increased when a psychosocial model of assessment was used as opposed to the biomedical phenotype. Therefore, it would appear the CGA is a more robust measure of assessment and as a result we have decided to use it to illustrate physiotherapy assessment. This will be described in further detail in the assessment section. The physiotherapist should be aware of the risk factors for frailty. If frailty is suspected, referral to other professionals may be required. Frailty is associated with poorer outcomes including disabilty and even death. Frailty and disability do not always co-exist, however they can be linked. In some cases, frailty may be a consequence of disability and in others, the causation of disability. 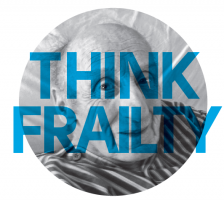 It is important to note that although frailty is age-related, it is not an inevitability. In those aged 65 to 85, there is thought to be a 10% incidence of frailty. However, this figure increases to 25 to 50% in those aged 85 and over. The success of modern medicine has resulted in an increase in average life expectancy. When the NHS was founded in 1948, 48% of the population died before reaching the age of 65; that figure has now decreased significantly to 14%. People are living longer, and as result, healthcare services are required to transform to better meet the population’s needs. As seen from the above graph, the percentage of the population aged over 65 is set to dramatically increase. As a result, it is thought that there could also be rise in the number of frail older adults in Scotland. Older adults and indeed frail adults are more likely to require healthcare resulting in a surge of pressure on the NHS; an already strained service. If you would like to view an animated version of the projected population growth, watch the video below. The next section will outline the length of stay and cost implications of frailty on the NHS. 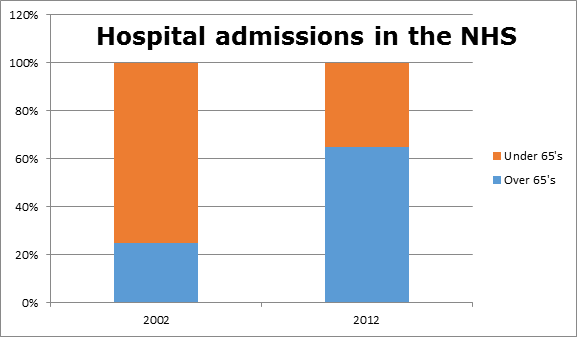 The latest UK statistics regarding hospital admissions and costs, which have been published relating to the years 2012-2013. Within this time frame 2,211,228 people over 60 were admitted to hospital in an emergency . 70% of day beds are occupied by people over 65; this is more than 51,000 beds at any one time. 85 year olds on average stay in hospital eight days longer than their younger counterparts. 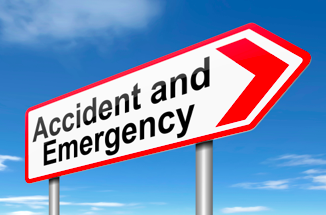 Most emergency admissions to hospital happen through accident and emergency departments. On average, a person over 85 spends 11 days in hospital. If they pass through accident and emergency the total spent is approximately £3241 per patient, per visit (Table 2). However, more than a 25% of over 85 year olds stay for 2 weeks and 10% stay longer than a month, when admitted as an emergency . This means that even more money is spent. 410,377 elderly persons were admitted to hospital due to a fall in 2013. Appropriate strategies could prevent this by up to 30%. The length of time frail people stay in hospital differs throughout the world. The UK is 16th shortest in the world when it comes to average length of stay in hospital. However, admittance to hospital and the cost implications of long term hospital stays are similar worldwide to the UK. The above statistics show that elderly people can spend a prolonged time in hospital, some of which may not be necessary and is very costly for the NHS. and hospital admissions in the frail population in Australia. An overview of hospital stays in the USA. Based upon the statistics and projections from the Scottish Government, over the next decade we will be faced with an ageing population with more elderly dependants. This means that there will be more of a financial strain on the NHS due to the prolonged hospital stays associated with age. 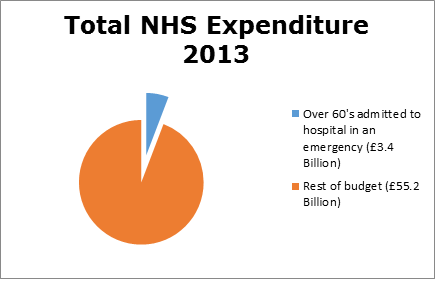 This indicates a need for change avoiding costly hospital admissions unless absolutely necessary. Increased provision in the community. Health and social care integration aims to increase the effectiveness of care while keeping associated costs low. The Department of Health report that at least one third of emergency admissions could be dealt with in the community Providing a free movement of information between hospitals and the community will allow increased communication and will reduce hospital admissions . Improving community facilities to promote physical activities. The physiotherapy service is included in all three strategies to improve the efficiency of care. We shall now discuss some of the current guidance from a variety of sources to help you work towards reducing hospital admissions in the frail elderly population with the view to reducing the strain on the NHS budget. health and social care partners are attempting to achieve through the integration. dementia, disability and frailty in later life. This section will present the most relevant guidelines and policies in relation to frailty and highlight the most useful points. It will discuss the current context of frailty in healthcare, aiming to enhance your understanding in relation to learning outcome 1. These policies and guidelines were chosen as they are the most current Scottish and British documents focusing on frailty in relation to managing frailty in the community and preventing hospital admissions. If you intend to work, or are currently working outwith the NHS, you might be required to familiarise yourself with policies in relation to your workplace. As the number of older people is increasing, there is an increased need to ensure appropriate care for them. Improving older people's acute care is a priority for the Scottish Government and in 2012 “The Older People’s Acute Care improvement programme (OPAC)” was commissioned by the Scottish Government. The document “Think Frailty” explored the strategies implemented in practice in more depth and will be discussed in Section 3.2. The report emphasises the importance to continue building on this work and Healthcare Improvement Scotland is committed to continue working with NHS Boards and staff to support learning and improvement of skills in relation to the management of frailty and delirium . As mentioned above, the Scottish Government provided funding for Healthcare Improvement Scotland's policy to improve health care for older people due to the rising numbers of unplanned admissions of this population. There is strong evidence for the benefits of CGA for frail patients. The programme is aiming to ensure that 95% of frail patients have a CGA and are admitted or referred to a specialist unit within 24 hours of admission. This case study report focuses on the work to identify frailty and ensure rapid CGA in four NHS boards in Scotland: NHS Ayrshire & Arran, NHS Grampian, NHS Lanarkshire and NHS Lothian. Valid screening tools reduce variability and increases the number of appropriate referrals to frailty services. Common aim for all sites: expanding the team. In particular physiotherapy and OT services so that a 7 day a week, around the clock service is available. The sites involved in this project were able to show significant improvements in outcomes for the frail elderly presenting at the hospital. These outcomes included a reduction in the number of admissions and re-admissions to hospital. This part of the Fit for Frailty guidelines by the British Geriatric Society (BGS) are intended to support health and social care professionals working with frail older people in the community. There are 5 main syndromes of frailty; Falls, change in mobility, delirium, change in continence and susceptibility to side effects of medication. Encountering one of these should raise suspicion of frailty. Gait speed, timed up and go test and the PRISMA questionnaire are recommended outcome measures to assess for frailty. The result of the CGA should be an individualised care and support plan (CSP). The CSP includes a named health or social care professional coordinating the person’s care. A plan for maintaining and optimising the person’s care as well as urgent, escalation and end of life care plans should be in place. Clinical guidelines provide evidence-based recommendations in relation to the management of a specific condition or syndrome. They are aiming to assist health and social care professionals in their decision making and help reduce undesirable variations in practice. The guidelines on frailty discussed above are aimed to all health and social care professionals and it has been found that these rarely go in depth in their explanation of specific healthcare professional's roles. As physiotherapists, it can be difficult to identify what recommendations are most applicable to our practice in relation to the management of frailty. In the Fit for Frailty guidelines, it is suggested that physiotherapists should play a role in assessing and treating frailty. It is reported that during every encounter with healthcare professionals, older people should be assessed for frailty. In addition to this, they also suggest that frail older adults would benefit from multidisciplinary assessment and intervention. Are physiotherapists routinely involved in this? In the Think Frailty document, NHS Grampian reports physiotherapists are involved in the rapid MDT assessment team, seeing those who meet the frailty criteria. NHS Lanarkshire states that physiotherapists work in an early discharge team to see frail patients at the front door. Whilst NHS Lothian’s frailty screening tool suggests a referral to physiotherapy if the patient meets the appropriate criteria. but what is our main role? The following sections of this learning resource aim to critically synthesise current evidence in order to present evidence-based information on the physiotherapists role in assessing and treating frailty. living with frailty in community settings. Social Service managers and Commissioners of Services. Silver Book - Quality Care For Older People with Urgent and Emergency Care Needs. This section will introduce you learning outcome 2 and we will begin to explore the role of the physiotherapist in preventing hospital admissions in a frail elderly population. The nature of the physiotherapy profession is to help restore movement and function in someone affected by illness or injury. Physiotherapy input in the treatment for frailty is not a new concept. However, as previously discussed, the delivery of care is evolving in order to better meet the needs of this population. Physiotherapist’s are expanding their service to deliver intervention outwith standard inpatient care and moving to several different settings; for example, within day hospitals, in the patient’s home and in community clinics. There is an emerging body of evidence supporting physiotherapy in emergency departments to assess and treat trauma and soft tissue injuries. However, could physiotherapists be included in emergency services to assist in preventing admissions of frail patients? In 2015, a physiotherapist joined forces with paramedics to treat non-life threatening emergency calls, with the aim of preventing unnecessary A&E attendances and reducing hospital admissions. Commonly seen conditions included falls, chronic pain, decreased mobility, exacerbations of long-term conditions and frailty. 57% of patients remained at home and it is thought that £2850 was saved every time a patient was not transferred to hospital. Furthermore, it has been suggested that physiotherapists could be stationed within hospital A&E departments to undertake frailty and falls risk screening and make rapid decisions on whether the patient can safely return to their pre-admission destination. However, little high quality research has been conducted and at present evidence is inconclusive, suggesting the need for further study in this area. Whilst having an awareness of the different settings is important, the physiotherapy assessment and treatment is likely to be similar from place to place. The next section will cover the assessment of a frail individual. This relates to learning outcome two and three. All the guidelines outlined above state a need for a CGA to be completed to diagnose patients who may be frail. From this assessment, a holistic interdisciplinary treatment program can be devised to suit the problems and needs of the individual. The assessment is usually carried out by a geriatrician or another trained professional, such as a physiotherapist. This assessment usually takes place when a patient is identified as possibly being frail; during acute illness, prior to surgery or when returning to a community environment. It is a multi-dimensional program, which looks at the patient's health (physical and mental), mobility and social status. This approach was introduced in 2001 by the Department of Health. There are five domains in which assessment takes place. Below is a table adapted from Martin, which identifies and outlines what should be included in each domain. The methods used to achieve this are specific to the region of the UK in which you work. However, the measurement tools should be standardised and reliable. Some measures identify problems while others examine their severity. The assessment will allow health professionals to identify the problems and allow for onward referral now and in the future. Once specific problems have been identified, onward referral can be made to appropriate healthcare professionals. This can then allow for a thorough assessment to be made around these problems. For example, a patient may be referred to physiotherapy to help increase mobility. A study examined whether a comprehensive assessment after an emergency admission is more effective when carried out by a team trained in a using a CGA. The paper showed that this approach reduced costs, length of hospital stay, deterioration and mortality. Routine follow up appointments are an essential part of the CGA and identify effectiveness of treatment. There is no specific time frame for these, yet follow up sessions usually occur when people are readmitted to hospital. In hospitalised patients, it has been shown to improve the accuracy of diagnosis and enhances management in both the long and short term. Completing a CGA in the community can prevent reductions in mobility and problems which arise from poor mobility by implementing treatment programmes tailored to all the patients’ needs. It can also reduce hospital stay, decrease the likelihood of readmission to hospital and reduce mortality. Why is this relevant to physiotherapy? Below we have split the physiotherapy assessment into the CGA sections to show that physiotherapists can use its structure to help them carry out a comprehensive, holistic assessment. How many of the key points can you recall? 1. Who carries out a comprehensive geriatric assessment? 2. Where can it take place? 3. What are its key components? 4. What effects can completing a CGA have? think may arise when carrying out this type of assessment. This activity should take 10 minutes to complete. Physiotherapists have the knowledge and skill level to carry out the functional aspect of the CGA. There is a lack of evidence supporting the use of specific assessment techniques for physiotherapists to adopt to complete a comprehensive functional assessment of a frail elderly person. However, there is a lot of evidence supporting the use of specific outcome measures within this population. These will be covered later in this section. Due to the above gap, only assessment techniques which have been reported in the literature will be included in this learning resource. There may be some common areas of assessment not covered; this does not mean they are not valid or useful to review when working with frail patients. Functional assessments are a way of determining health needs now and in the future. Assessments of patients with frailty should occur after every illness or injury to establish the effect the episode had on the patient’s functional ability. More specifically, functional assessments should be done on every patient over 75 years old. The functional assessment element of the CGA compromises of: gait, balance, abilities to carry out activities of daily living (both fundamental and basic) and activity/exercise status. All these areas should be assessed by the attending physiotherapist. The subjective assessment will be very similar to that of any other patient. Yet, some specific questions related to age and frailty must be asked. Has anything changed recently in terms of the patient's: vision, hearing, mobility status, cognitive ability, medication usage or activity levels? Falls risk assessment tool (FRAT) questions should be asked which regard falls history and mobility status. When did they last fall and why? How often do they fall? The context around circumstances of the fall should also be asked, like mechanism of fall, home set up and medication use. It is useful to know about the patient's dietary intake. Do they have help or support with activities of daily living from anyone? Do they give help or support to anyone?. Think about why the above questions are important to ask with this type of patient. This task should take 20 minutes. It is important to know any changes which could affect the rest of your assessment and treatment plan. How could these changes have impacted on the patient's life? Can we help to change any issue or problem? We need to know about any previous falls. This will help determine their mobility status and how well they are coping. The FRAT tool is helpful to determine future falls risk.We can then tailor treatment where it is needed. You can get an idea of what ADL’s they are able to do, how they are coping with these demands and how busy they are throughout the day. The objective assessment should begin by observing posture, skin condition and body shape. This can give you clues as to their general health and the extent of their frailty. The therapist should have an idea as to what level of independence the patient has and how much physical activity they carry out on a daily basis. This can be achieved by using outcome measures such as the timed up and go, which has been shown to have good reliability and validity as a tool for measuring the mobility status of patients who are frail . This type of information can also be gathered through the subjective assessment. As gait speed is a key measure of frailty, it is important for physiotherapists to measure it. A speed of less than 0.8 m/sec indicates frailty. Keeping track of the patient’s gait speed will enable the physiotherapist to objectively measure patient progress. Endurance can be tested by completing multiple sit to stands or by carrying out a Six-Minute Walk Test. Monitoring the patient's heart rate during this will give an indication of their bodies ability to respond to increased effort. The six minute walk test has been shown to be valid and reliable within this population. Measuring endurance gives the physiotherapist an indication of how far the patient is likely to be able to walk, which can aid treatment planning and goal setting. Analysing the individuals gait is also important. However, the difference in gait in people who are frail has not been widely researched. As well as frail individuals having reduced gait speed, they also have reduced stride length and cadence. Reductions in stride length are linked with the severity of frailty and come about due to sarcopenia and associated lower limb weakness. It is advised that in order to truly assess gait, the person should be asked to walk at their maximum speed. Balance should be assessed comprehensively as this will allow for individualised treatment. 75% of people over 70 have reduced balance, which can increase falls risk. Whilst some physiotherapists prefer using their own observations to assess balance, others favour the use of standardised outcome measures. The Berg Balance Scale, Single Leg Stance Test and Timed Up and Go were seen by physiotherapists as useful tools to measure functional ability. Furthermore, balance outcome measures were assessed in a systematic review for their psychometric properties. There are many which the physiotherapist can use, however, very few measure all aspects of balance. Testing a patient's reactive balance was one area which was rarely examined. It is therefore important to know what aspects of balance and postural awareness are being tested by the outcome measure so that treatment will be tailored to problems. Reduced balance is linked with increasing falls risk and hospitalisation. Good indicators of falls risk are the Berg Balance Scale and the Tinneti Balance and Gait Assessment as these both look at functional balance. A home assessment can identify if modifications need to occur to allow for increased safety. See the Environment section. As previously mentioned, reduced grip strength is an indicator of frailty. Grip strength can be tested by using a grip ball dynamometer and which has been shown to be accurate and comfortable for people with frailty to use. It is important to measure grip strength, as weakness can limit the patient's ability to carry out activities of daily living. Determining ROM is important with this population as a link between reduced lower limb mobility and fall prevalence has been found. Ankle plantarflexion and hip extension, internal rotation and abduction were found to be reduced. Tibiotarsal range is also important to measure as it can impact on posture. It is therefore important to establish if your patient has reduced ROM as tailored intervention may help reduce falls. ADLs can help establish the functional ROM and strength of frail patients. 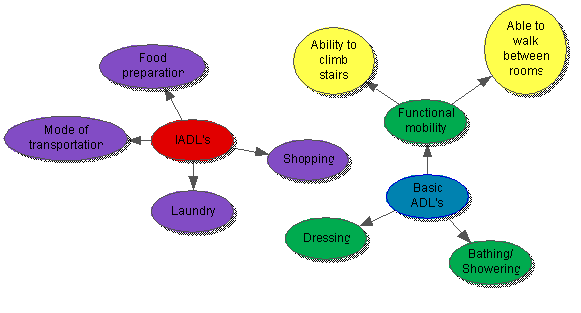 Two main types of ADLs should be assessed: instrumental (IADLs) and basic. instrumental ADLs are activities which are needed for a person to live independently in the community. IADLs are important to measure as an inability to do these is a better indicator of dysfunction than ability to self-care. The percentage of elderly people reported as being independent increased to 65.4% from 46.5% when looking at basic ADLs, when compared to IADLs. 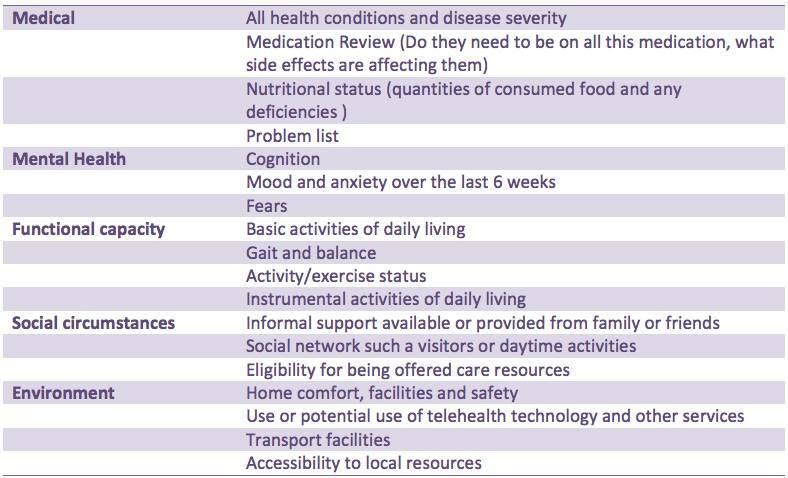 There are standardised outcome measures in which to assess IADLs, yet the specific activities needed to enable independence vary depending on the environment and social aspects of the patient's life. It is therefore important to have a grasp of what the patient needs to be able to do to remain independent and then review these activities. Functional dependence should be assessed, as there are correlations between dependence and increased length of stay in hospital. Outcome measures may be useful to assess the patient's ability, but also to track the patient’s progress. There are many different outcome measures to choose from in this population. Some were specifically designed for frailty, while others were developed for other conditions but have been shown to have good psychometric properties within this population. The next section will review some commonly used outcome measures. However, this is not an exhortative list and will not necessarily be the best to use with each patient. It is up to the clinician to select the most appropriate measure for their practice. Excellent test-retest reliability and high concurrent validity when compared to the shorter 4 metre walking test. High concurrent validity in the frail population with a 10 metre and 20 metre walk test . 12 questions related to cognition, general health status, mobility, social status, medication use, nutrition, mood, continence and functional performance. It has a total score of 17 which depicts severe frailty. It is a very brief way of assessing for frailty and can be used to see whether a CGA should take place. A questionnaire devised of seven yes or no questions that can be used when the patient is unable to carry out a Stand Up and Go or a 10 Metre Walk Test. It was developed with a service in Canadian healthcare, to integrate frailty assessment and management and allow for increase patient-centred care. Using this approach can reduce hospitalisation and is an encouraged approach across systems. It measures the patient's ability to look after themselves by asking 10 questions and answers that are graded on the amount of assistance needed to carry out the activity. The interrater reliability of this outcome is fair to good depending on which activity is being assessed. The Tinetti is a 17 item OM used to assess gait and balance. 52% sensitivity (good predictor of falls risk). Excellent test-retest and intrarater reliability. In community-dwelling older adults, the concurrent validity was adequate when compared to the Timed Up and Go. Assesses mobility in the frail by completing 20 components. Both the Edmonton frail scale and the PRISMA 7 can be used by physiotherapists to determine whether a patient who displays symptoms of frailty is frail or not. If a positive result is found, they could refer a patient back to their GP for further assessment and intervention. Assessing frail elderly patients can be challenging as a thorough assessment can take a long time. List a few reasons why this may be the case. This should take 5 minutes. Answers are below. A thorough top to toe assessment needs to be done including all elements of the ICF model. Are there any cognitive issues present? These include dementia and long-term or short-term memory problems. Cognitive function in the elderly has been shown to have a strong association with reduced functional performance. It can also impact on how you carry out your assessment and communicate with the patient. Visual problems - the patient may not be able to see you or what you are trying to get them to do clearly. Easily fatigued - causing patients to have reduced performance in activities which occur at the end of the assessment. This may skew the results of any outcome measures used. Reduced or slow mobility (i.e. Sit-stand takes longer). Assessment of known frail patients is important and should be carried out by physiotherapists at the first contact with every patient. Outcome measures should be regularly administered to review the physiotherapists’ effectiveness at improving frailty. There are specific elements which need to be measured with people who are frail: ADL ability, Gait; speed and quality, endurance, balance, strength and falls risk. Doing these may help prevent hospital admissions. You have reached the end of the functional assessment section. you carry out with patients who are frail. As the human body ages, it is susceptible to various changes. Increase stress on the heart to maintain oxygen levels in the body. Reduced levels of minerals, bones become less dense and more fragile. Susceptible to osteoporosis and fractures. It is beyond the scope of this learning resource to go into depth about different health conditions that are prevalent in the frail population. However, we have provided additional reading if you wish to know more. Frail adults are highly likely to be prescribed medication to treat their symptoms and co-morbidities. Below you will find a list of common medications, the conditions they are used to treat, some common side effects and some named examples. duloxetine, venlafaxine, mirtazapine, amitriptyline, imipramine, lithium. Side effects of medication such as drowsiness, blurred vision and insomnia can interfere with the treatment session and also delay any recovery. It is therefore important for physiotherapists to know if the patient is on any medication and the associated side effects so they can modify treatments. Polypharmacy is the use of multiple medications and is often unavoidable as the elderly population are more likely to have several co-morbidities. Polypharmacy introduces drug interaction, this can be harmful as when combined, some medications increase the risk of adverse drug reactions (ADRs). ADRs can become a vicious cycle where more drugs are prescribed in order to treat side effects. This can result in increased numbers of unnecessary and potentially harmful medications. The physiotherapist can help prevent polypharmacy and the vicious cycle by recognising changes in the patient's response to their drug therapy and highlighting need for medication review. It is fundamental for physiotherapists to have knowledge and understanding of common medicine and their adverse side effects. Nutrition is important for this population and it should be part of the physiotherapist's subjective assessment to check dietary intake. The physiotherapist can then reinforce good eating habits and if needed, refer the patient to a dietician. It is also important to have an idea about how much the patient eats as this could contribute to increased fatigue. A reduced tolerance to activity is present in frail patients and the physiotherapist should be mindful of this when assessing and treating. listing the condition, the cause and the symptoms. their consequences and possible prevention strategies. and falls in elderly patient in primary care. Although it is not the prime role of a physiotherapist, in order to provide a holistic service, we must be aware of and understand the mental health of our patients and the impact that this may have on the individual. Age-related cognitive decline is inevitable, however, some conditions common amongst frail adults can have dramatic effects on cognition. Organic disorders are usually caused by disease affecting the brain, for example, dementia or delirium. Table 7 compares age-related cognitive decline with the early signs of dementia. The word dementia describes a set of symptoms that could include memory disorders, personality changes and impaired reasoning. There are various types of dementia, the most common are Alzheimer’s disease, vascular dementia and dementia with Lewy bodies. The likelihood of developing dementia increases drastically with age and it is thought that 1 in 14 people over 65 suffer from this condition. Due to the progressive nature of the disease, communication will gradually worsen over time. Delirium is a common clinical syndrome categorised by fluctuating cognitive function and disturbed consciousness. It usually develops over 1–2 days, however, it is associated with poor outcomes. Delirium can be hypoactive or hyperactive, occasionally people will display signs of a mixed picture. Hyperactive delirium usually manifests itself as restlessness, agitation and aggression, whereas people with hypoactive delirium present as withdrawn and quiet. It is thought that the prevalence of delirium on medical wards is 20 to 30%, but reporting in the UK is poor and it is expected this figure is underestimated. People who develop delirium are more likely to stay longer in hospital and have more hospital-acquired complications, such as falls. The physiotherapist may be the patient’s first contact with healthcare and they may be required to screen for delirium. OPAC have created a delirium toolkit (see additional reading) and recommend the use of the 4AT. Any abnormal results should be discussed with the relevant healthcare professionals. What does this mean for physiotherapists? With any cognitive condition, effective communication may become challenging and prove to be a barrier to successful assessment and treatment. Table 8 highlights some tips to tackle this. 2. Allow plenty of time for a response before repeating your question. If the patient is still struggling, try rephrasing. 3. Remove distractions – this could include talking, background noise, eye-catching pictures. Visual – show tasks rather than explaining instructions. 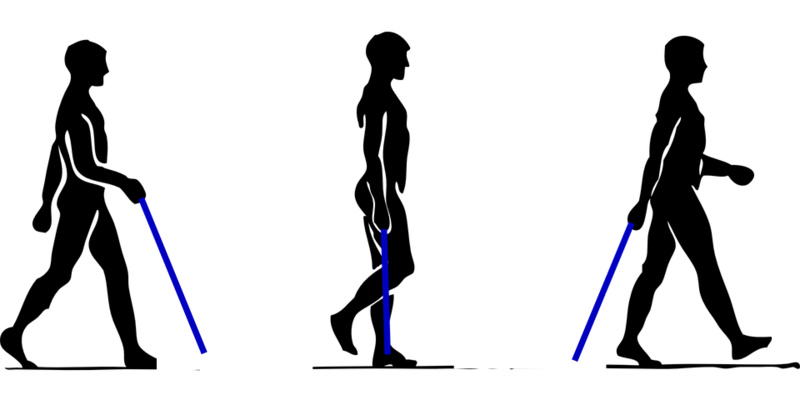 Sound – cueing can encourage normal movement. For example, counting or using music can provide a rhythm and trigger a response. It may also help provide an auditory clue when the patient cannot understand the verbal instruction – patting the chair to signify “sit down”. Tactile – can be used to aid the movement. For example, offering a hand when walking, stroking up the spine when standing. Now watch this video which describes effective communication specifically for people with dementia, however, some of this could be applied to anyone with cognitive decline. Functional disorders have a predominately psychological cause and may include conditions such as depression or anxiety. 1 in 5 community-dwelling older adults are thought to suffer from depression. Whilst this statistic is alarming, it has been suggested that older adults are more susceptible to depression as with age, they become more exposed to chronic conditions, health concerns and death, particularly of loved ones. Depression comes with a whole range of symptoms and these vary from person to person. Now watch this video which explores the cause of depression in ageing. The most recently published statistics suggest that 17% of older adults suffer from an anxiety disorder. Anxiety has a wide range of physical and psychological symptoms that can have a debilitating effect on an individual’s life; they may be able to complete tasks physically, however, are limited by their mental health. Anxiety disorders are usually treated with medication but alternative therapies such as cognitive behavioural therapy and hypnotherapy are also known to be used. Lack of motivation is common amongst most frail adults, including those with a functional mental health disorder and treatment to tackle this can feature heavily in your physiotherapy treatment plan. This will be discussed in further detail in the motivation section. Read this for more information on dementia. Nice guidelines for prevention, diagnosis and treatment of delirium. Read this for evidence-based information on delirium. Assessing this type of information is also a key component of the common assessment framework for adults, which was published by the Department of Health. It is primarily an occupational therapists (OT’s) role to devise interventions and amend any problems with these. Their assessment and the subsequent home modifications and adaptions can help increase the functional abilities of people who are frail. However, a patient's ability to carry out activities in the home is dependent on its layout and their social situation. As physiotherapy interventions try to help improve people's ability to perform ADLs, it is important for physiotherapists to know how the environment and social situation can impact on their treatment. The ICF is a model which allows professionals to see the impact a health condition has on a person's life by taking a holistic viewpoint. Participation restrictions and activity limitations are the two areas of the ICF which relate to the influence of the patient's social and environmental circumstances. Activity limitations are the execution of a task by the patient, whereas, participation restrictions relate to how involved with a life situation the patient is due to the societal setup. The World Health Organization (WHO) has devised a checklist which allows clinicians to identify what activity and participation restrictions the patient has. Musculoskeletal impairments cause the majority of activity limitations in elderly community-dwelling adults . Physiotherapists are therefore in a prime position to help reduce activity limitations. A study by Mast and Azar found a correlation between ADL limitations and readmission to hospital in the geriatric population. This shows that physiotherapy targeted at reducing activity limitations could reduce hospital stay as well as improving social network and participation. Taking a social history allows the physiotherapist to understand the patient's current level of functioning and their desired functional goals. This should include assessment of activities they do in and outside their home and what formal or informal care or support they receive. 80% of nonagenarians have carers to help with some of their ADLs. Having a small amount of regular help with ADL’s may prevent an acute episode turning into an emergency, where the patient is no longer safe to stay at home. This shows the importance of knowing the patient's social circumstances. Elderly people who experience activity limitations sometimes also have participation restrictions . Knowing what participation restrictions a patient has is important as they are linked to the patient's quality of life. Participation frequency should also be noted. It is common for people with frailty who live in the community to report having participation restrictions. This is due to reduced community mobility and a reduced ability to carry out work both at home and in the community. Increased participation restrictions are also linked with increasing age. The symptoms of frailty most closely linked to participation restrictions are grip strength, mobility and the number of co-morbidities a patient has. Participation is also linked to environmental factors such as, access to public transport. It has been shown that mobility levels can remain constant even though the patient's condition may decline . 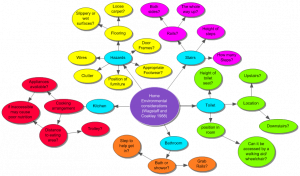 Create a mind map around the different hazards that can be found in the house. This should include the bathroom, the kitchen and the stairs. This activity should take 20 minutes. The mind map above shows the different things which should be checked in the patients' house on assessment, before a treatment plan is devised or goals are set. Sometimes these assessments are performed jointly with an OT. Being aware of the environment in which the patient lives will allow the physiotherapist to tailor treatments effectively and safely to their surroundings. What are activity limitations and participation restrictions? What are the four most common activity limitations in the frail elderly? What is the link between participation restrictions and the frailty phenotypes? Why should physiotherapists take a social history from their patients? You have now reached the end the physiotherapy assessment section. He was happy for the referral to a community physiotherapist to be made. objective assessment after the treatment section. Having considered the assessment, we will now move on to explore potential physiotherapy interventions and application in clinical practice in relation to learning outcomes 2 and 3. As previously mentioned, there are several clinical guidelines available for healthcare professionals to assist them in preventing hospital admissions providing quality care for patients. However, whilst they recommend physiotherapy intervention, these guidelines lack rigorous information and evidence surrounding treatment. This section will summarise and synthesise available evidence on physiotherapy treatment options for preventing hospital admissions in the frail elderly. As there is a lack of evidence available on the effect of physiotherapy in reducing hospital admissions in frail adults, some of the evidence here has been extrapolated from an older adult population and using outcome measures that are thought to reduce likelihood of admission, for example, falls risk. As two thirds of NHS clients are aged 65 or over, there is a plethora of different occasions in which an older person may be admitted to hospital, however, it can be loosely split into two categories: injury and illness . For the purpose of condensing this learning resource and delivering the information you are more likely to need, we will consider the more common admission causes that the physiotherapist can play a part in preventing. However, some of the information provided here could be transferable to other cases. Injuries leading to hospitalisation are more common in people over 65 and they can be more critical and more often preventable. The increasing age of the population heightens the significance of this problem. Falls represent the most frequent and serious type of accident in people aged 65 and over in the UK . Gowing and Jain found that a fall is the most common mechanism of injury in elderly trauma patients presenting to accident and emergency units and falls cases are the most common presentation to the Scottish Ambulance Service in the older adult population. A fall is an incident which results in a person coming to rest unintentionally on the floor or ground or other lower level and can result in fracture, dislocation, traumatic brain injury and even death. Anyone can have a fall, however, the natural ageing process means that older people are at higher risk. Over 400 risk factors leading to falls have been highlighted (Table 9). The risk of falls and related complications increase gradually with age and can be an indication of increasing frailty. Falls represent the main cause of disability and are the leading cause of morbidity and mortality among people over 75 in the UK. Not all falls will result in injury, however in some cases, a fall could be fatal and it is thought that the repercussions of even a minor fall could have catastrophic effects on physical and mental health. Despite the above statistics, falls are not an inevitable consequence of old age. A multifaceted interaction of several risk factors relating to the ageing process, lifestyle choices, environmental factors and the presence of long term conditions determines an individual’s risk of falling. As risk increases with age, it is important for the physiotherapist to identify those at risk early, recognise and modify risk factors and provide timely intervention to prevent falls and subsequent injury. A summary of some potential treatment options follows. This list is not exhaustive. A significant component of age-related weakness and frailty is sarcopenia. Sarcopenia is the gradual loss of muscle tissue, resulting in diminished strength and it is thought that 2% of skeletal muscle mass is lost each year past the age of 50. Sarcopenia increases the risk of frailty and falls and in turn, hospitalization in the older adult population. Resistance training has been suggested as a potential treatment for sarcopenia and its prevention. Resistance training is designed to improve muscular fitness by exercising a muscle or a muscle group against resistance. This could lead to improved function, increased quality of life and reduced likelihood for falls. Resistance training programmes have consistently shown to improve muscle strength and mass in older adults, however, it is questionable whether this transfers to reducing the risk of falling. Latham and colleagues have conducted the only trial which has studied the effect of seated resistance training on risk of falls in an older adult population. This study solely involved home-based, progressive, seated quadriceps strength exercises using 60 to 80% of the individuals 1RM with ankle weights. It was found to have no effect on falls rate or risk of falling and an increased chance of musculoskeletal injury. As a result, seated resistance training or high intensity resistance are not recommended. Furthermore, Liu-Ambrose and colleagues examined the effect of a twice weekly course of 50-minute resistance training sessions on number of falls and risk of falls in a female population aged 75-85. Exercises included targeted upper limb, trunk and lower limb muscles and again, resistance training alone was found to have no significant effect on number of falls or risk of falls. However, when combined with agility training, participants did develop a decreased risk of falling. It has been proposed that strength training alone is not enough to fully manage falls risk, however, it should be part of a multi-component falls prevention exercise programme. We will discuss this in further detail later on in the learning resource. Balance disorders are very common in frail older adults and are a key cause of falls in this population. They are associated with reduced level of function, as well as an increased risk of disease and death. Most balance disorders comprise of several contributing factors including long-term conditions and medication side effects. Recent research conducted examined the effectiveness of two-year progressive balance retraining in reducing injurious falls among community-dwelling women aged 75-85. The study took place over 20 centres and recruited 706 participants, who were randomised in to the intervention group, who received weekly dynamic balance exercise supplemented by prescribed home exercise, or the control group, who did not take part in the exercise. Over the two-year intervention period, the injurious fall rate was 19% lower in the intervention group than in the control group highlighting the benefit of a balance training programme. Exergaming is a relatively new treatment concept and is thought to increase motivation and enjoyment for users. The Nintendo Wii has a built in pressure sensor that allows for feedback to be delivered to the user on their performance. 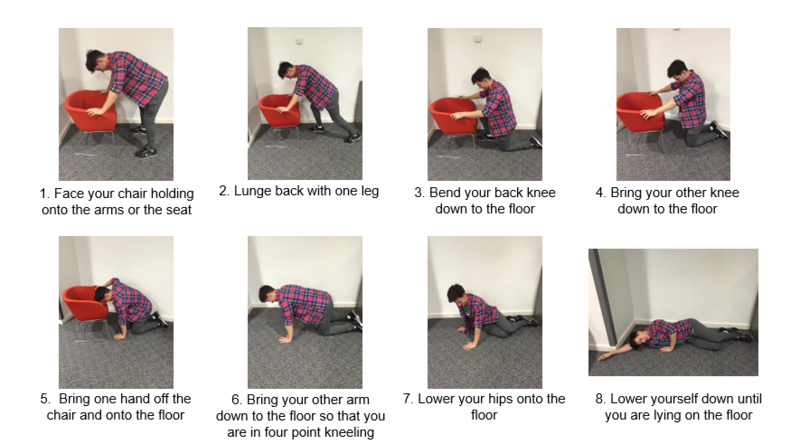 There is evidence that a Wii based balance exercise programme could improve balance ability in the frail elderly population, so as a result, Fu and colleagues conducted research into whether this would transfer to reducing fall risk and incidence. Sixty participants aged 65 or over received balance training three times per week for six weeks. They were randomly allocated into the intervention group who undertook balance activity on the Wii, or the control group who received conventional exercise. The results showed that while both groups reduced their risk and incidence of falls, the intervention group showed a more significant improvement. The Wii balance training has shown to reduce falls by 69% compared with conventional training. Additionally, the intervention group had a 35% improvement in the fall risk score, considerably greater than that of the conventional balance training at 11%. As a result, the use of the Nintendo Wii for balance re-education is highly recommended and perhaps this suggests the need for further research on various other computer games available. Exercise aimed at improving balance control has been proven to be a key component in falls prevention. It will be explored further in the multi-component falls prevention programme section of this resource. Tai chi is a newly emerging exercise incorporating breathing, relaxation and slow and gentle movements with strengthening and balance exercises. Whilst originally an ancient 13th century Chinese martial art, it has recently become more prevalent around the world as a health-promoting exercise. Whilst there is room for more rigorous research on the health benefits of tai chi, it is thought that it could help adults aged 65 and over in improving balance, reducing stress and controlling osteoarthritis pain. Additionally, in a high quality systematic review, tai chi was not only found to significantly reduce rate of falls, but also lessen risk of falls. As tai chi is considered a low impact exercise, it is suitable for most to participate in and should be considered as a treatment option, although some may require assistance in locating a suitable local group for them to join. Watch this video clip highlighting the benefits of tai chi through several interviews. Take 5 minutes to reflect upon the opinion of the participants. What health benefits did they see? Declining muscle function in older adults reduces their ability to rise from the floor following a fall and up to a half of all non-injured fallers are unable to get up. When someone is unable to get up off the floor unassisted, the associated risks are far greater due to the complications that can occur from lying on the floor for an extended period of time – for example, dehydration, hypothermia, pneumonia, pressure sores, unavoidable incontinence and even death. This inability to get up has a poor prognosis in terms of hospitalisation and mortality, thus, a long lie is one of the most serious consequences of a fall. The responsibility of the physiotherapist is to ensure the patient has a plan should they fall and are unable to rise and educate them about available strategies to combat this. Backward chaining is a method utilised to re-educate patients in rising from the floor unassisted. It consists of a sequence of movements combined together to help teach someone to be able to get down to the floor safely. Once learnt, the sequence is reversed and is applied to teach a safe and effective way to get up from the floor. The movement is broken into several stages depending on the patient’s ability. The patient will complete one stage, then return to a stand. Then they will add on the next stage and return to a stand. This is repeated until the patient is able to stand from lying on the floor. The effect of backward chaining on an individual’s ability to rise unassisted from the ground has been proven to be beneficial. In the only study to compare backward chaining with a control of conventional therapy, it was found that the backward-chaining method significantly enhances ability in rising after an incidental fall (20-40%). The control group showed no improvement. The study took part over 12 weeks and included 120 participants aged 80-99. Additionally, Timed Up and Go and Tinetti measurements were also compared before and after the intervention and control and a notable improvement was only observed from the intervention group. This highlights the benefits for improving functional capabilities in addition to rising abilities. If you are unfamiliar with backward chaining, take 20 minutes to practice a routine yourself. the concept of backward chaining can sometimes be confusing. This should make it easier to teach to a patient. Make sure you have plenty of space around you. The only equipment required is a chair. The prevalence of fear of falling in community-dwelling older adults ranges between 12% and 65%. Whilst it frequently occurs after falls, it is also established in those without a fall history. It can lead to a loss of independence, activity restriction and ultimately a poorer quality of life. Not all will avoid ADLs due to fear but for those who do, it can have debilitating and devastating effects. Lethem et al introduced the psychiatric concept of a fear avoidance model and is it is commonly utilised in the prevention of acute musculoskeletal pain becoming chronic. However, the hypothesis behind the model can be adapted to explain fear of falling and avoidance of activity. Extreme avoidance can lead to a decline in physical function, and ultimately an increased risk of falls, further fuelling fear and avoidance of activities. This is illustrated in the below fear avoidance model, adapted from Lethem et al. The physiotherapist is in an ideal position to steer the individual towards the route of confrontation and recovery as opposed to activity avoidance and disability. There is high quality evidence from two systematic reviews highlighting the benefits of treatment to improve confidence and reduce fear of falling. Recommended interventions include: exercise, including tai chi, and multi-component falls prevention programmes. Finally, we will consider the effect of a multi-component falls prevention programme. As most falls are multifactorial in origin, they usually require several interventions. Such interventions typically involve a combination of medication review and optimisation and education, environmental modification and exercise. This type of programme would be delivered by a multidisciplinary team in which the physiotherapist would be a key member. A Cochrane systematic review suggests that the physiotherapy treatment should combine all elements mentioned above; that is strengthening, balance, backward chaining, tai chi and confidence building with education, tailored to each individual. 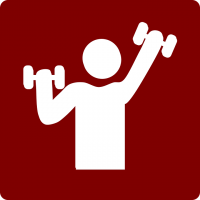 Clinic-based group exercise or individual exercise in the home setting is suitable. However, further research is needed into the effectiveness of medication management in preventing falls. Additionally, in a systematic review, it was reported that for the greatest effect, exercise programmes should include a high level challenge to balance, alongside strength and walking training. However, brisk walking training should not be prescribed to those at a high risk of falls. Furthermore, it was found that exercise should not only target those at high risk but also the general community and it should be performed for at least two hours per week on an ongoing basis. Write down the key points you have learned from Section 6.1 Injury. Expand the picture below and compare your answers. This activity should take 15 minutes. AGILE guidelines for physiotherapy management of older people at risk of falling. AGILE is the CSP’s professional network for members working with older people. the area. This website is also a useful resource you can direct patients to. NHS Bridgewater Falls Leaflet. Does your trust have something similar? For many people, older age is associated with long term conditions such as heart failure, dementia, chronic obstructive pulmonary disease (COPD) and diabetes. As we know, an element of frailty is the decreased ability to withstand illness. Exacerbation of chronic conditions, an acute illness or a combination of both can trigger acute disability in frail older people and cause hospitalisation or institutionalisation. Therefore, this next section will discuss the physiotherapist's role in promoting self-management of long term conditions and physical activity. Information on how to motivate people for behaviour change will also be presented. Emergency hospital admissions is a major concern for the NHS. There are a number of factors associated with increased rates of admission including area of residency, ethnicity, socio-economic deprivation and environmental factors. Older people are also identified as being at a higher risk of hospital admittance. In Scotland, 40% of the population have at least one long term condition (LTC). People with LTCs and co-morbidities are known to have poorer clinical outcomes, poorer quality of life and longer hospital stays. The Scottish Government reports that people with LTCs are twice as likely to be admitted to hospital. The ageing population and the increased prevalence of LTCs requires healthcare professionals to move their focus towards preventative strategies and empowering self-management. Disease-related self-management abilities such as taking medication and exercise are often promoted by health care professionals. However, there may also be a need for interventions aimed at self-management of overall health and well-being to contribute to healthy ageing. Older peoples’ abilities to self-manage the effects of the ageing process depends on physical, psychological and social aspects of their life. Physiotherapists working with frail older people could play a role in promoting healthy ageing. Evidence shows that interventions to promote healthy ageing can be used to the delay the onset of frailty and reduce its adverse outcomes among older people. As older people often have co-morbidities leading to a mixture of physical and psychosocial issues, self-management interventions should focus on providing them with general behavioural and cognitive skills for dealing with range of problems, rather than focusing on health-related problems only. It is outwith the scope of this learning resource to go into detail about how to promote self-management strategies as you are likely to see a range of diverse patients presenting with multiple conditions and challenging psychosocial issues. Your treatment plan will depend on the patient's presenting condition. However, as physiotherapists, we believe our main role within self-management can be to promote physical activity to contribute to the healthy ageing process. Therefore, this will be discussed in more detail in Section 6.2.2 – Physical activity. Please see additional reading to access useful resources in relation to promoting self-management. with the ageing population and the increased prevalence of long term conditions. conditions and identifies how healthcare professionals can support them to do so. 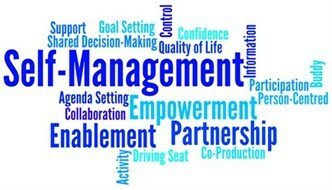 self-management and how you as a healthcare professional can help facilitate this. NHS 24 is an online and telephone-based service. Call for free (111) and they can answer questions about your health and offer advice. Visit their website to access self-help guides and find local services in Scotland. NHS Lothian’s self-management plans for COPD, bronchiectasis and asthma. The British Lung Foundation have developed tools and self-management plans for people living with COPD. Exercise handbooks, symptoms diary and flare up action plans amongst other useful information can be found on their website. Chest, Heart & Stroke Scotland’s factsheets and booklets. Alzheimer's Scotland’s resources on living with dementia. Age UK’s information and advice guides in relation to health and wellbeing & home and care. This list is not exhaustive but gives an idea of some resources patients can be directed to. Functional capacity declines with age and this is further accelerated by low levels of physical activity. Physical activity significantly decreases with age. 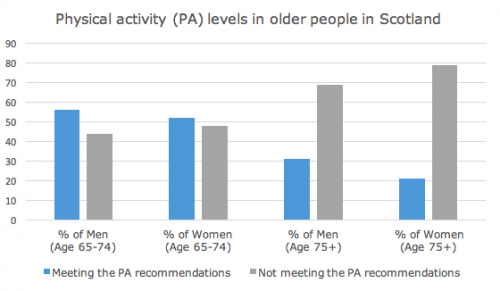 The graph below shows the percentage of men and women meeting the physical activity recommendations in Scotland. Strength, endurance, balance and bone density is lost at a rate of 10% per decade, while muscle power reduces at around 30% per decade. Sarcopenia is highly prevalent among older adults and has been identified as a risk factor for frailty. Being physically active slows down these physiological changes associated with ageing. Physical activity can also reduce the risk of falls, promote cognitive health and self-management of chronic diseases. It can also slow down the deterioration in ability to perform ADLs and maintain quality of life in older adults. A meta-analysis found that exercise is beneficial to improve balance, gait speed and abilities to carry out ADLs in the frail older adult population. Older peoples’ participation in physical activity can be effected by biological, demographic, physiological and social factors. These factors are important to be aware of when attempting to motivate older people to increase their activity levels. Due to their training and experience, physiotherapists are in a good position to promote health and wellbeing of individuals and the community through education on physical activity and exercise prescription. Recently there has been a shift in the general public's health agenda towards the prevention of chronic conditions and enabling the ageing population to stay active and manage conditions in the community. This has required a change in the role of the physiotherapist towards addressing these issues through promotion of physical activity and other lifestyle changes. There is a National Physical Activity Pathway for Secondary Care established to support all healthcare professionals to raise the issue of physical activity, offer simple advice and suggest appropriate activities. If you prefer reading about The National Physical Activity Pathway, please access the document Physical Activity Pathway in Secondary Care. on how much physical activity people should be doing in relation to their age. climbing walls, woodlands, swimming beaches, national cycle routes and lots more. Edinburgh Leisure’s website can assist with finding activities in Lothian for older adults. Steady steps is one of the group based activities run by Edinburgh Leisure in partnership with NHS Lothian. This programme delivers group exercise classes for older people who have had a fall or are at risk of falling. Get active your way every day. This guide is aimed at young adults, adults and older people and provides information about being active. It is designed for healthcare professionals to give to their patients. Age UKs advice on how to keep fit. achieving a goal. Motivation often stems from a need we must fulfil and this leads to a specific behaviour. In 1943, Maslow developed a theory of human motivation aiming to explain and rank all types of human needs. Maslow’s Hierarchy model is made up of five levels ranked in importance with the most basic needs at the bottom. In order to progress up the hierarchy, the lower needs must be fulfilled. Depending on your preferred ways of learning, choose if you want to read or watch the video below to learn more about the Maslow’s Hierarchy. Maslow’s hierarchy model is made up of five levels represented in a pyramid with the most basic needs at the bottom working up to the more complex needs. Physiological needs are your basic requirements for survival, for example food, water, warmth. Once the Physiological needs have been met the individual will be able to work towards fulfilling their Safety needs. This continues through each level and moving on to the next once the previous level has been satisfied adequately. 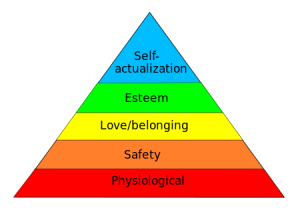 Maslow’s Hierarchy provides professionals with an insight into how successful their efforts of motivation may be with individuals. a better idea of what their requirements from us may be. For example; a patient who is currently not motivated to eat and drink would not be likely to respond well to a physiotherapist trying to get them up and on their feet. onto the next level of Maslow’s Hierarchy and progressing their treatment. 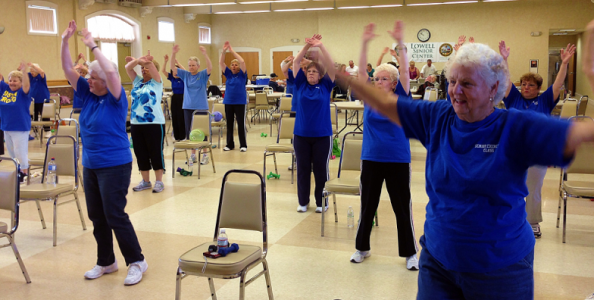 What motivates the elderly to exercise? Shown in the bubbles are some factors that motivate the elderly to participate in exercise programs. Further to this, it is suggested that we must show a willingness to listen to the patient and their needs. As therapists, we can draw upon the benefits of a group exercise class to help motivate the elderly, as this gives them not only the physical benefits of exercise, but allows them to participate in a social gathering. Furthermore, research suggests that people are more likely to exercise if they have a companion. You have now completed the Treatment section. your reflection prior to starting. Are there any similarities/differences between your first thoughts and your final reflection? 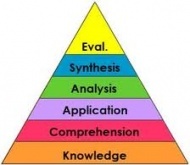 How can you best apply the knowledge gained? Is there anything you would now do differently? Is there any additional reading you need to carry out? As previously discussed, the average age of the population is increasing and it is suggested that the prevalence of frailty will multiply. Subsequently, there has been a shift of care from reactive to preventative strategies and a focus on providing early interventions to reduce costly unplanned admissions to hospital. Several guidelines are available, but none specifically detail the physiotherapist's role. Therefore, we have developed the above learning resource aimed to increase your knowledge and awareness of the role in the assessment and treatment of frail elderly patients to prevent hospital admissions. Critically evaluate the physiotherapists’ role in the holistic assessment and treatment of frail individuals to prevent hospital admission. Evaluate the skills and knowledge gained from this resource; identify appropriate application in clinical practice. You have now completed this 10-hour learning resource, well done! ↑ 1.0 1.1 Karunananthan S, Wolfson C, Bergman H, Beland F, Hogan DB. A multidisciplinary systematic literature review on frailty: overview of the methodology used by the Canadian Initiative on Frailty and Aging. BMC Med Res Methodol 2009;9:68. ↑ 2.0 2.1 Edwards N. Community services - how they can transform care. London: The King's Fund, 2014. ↑ Biggs J. Teaching for quality learning at university. Buckingham: Society for Research into Higher Education and Open University Press, 1999. ↑ 10.0 10.1 10.2 10.3 10.4 10.5 Martin F. Comprehensive Assessment of the Frail Older Patient. http://www.bgs.org.uk/index.php/topresources/publicationfind/goodpractice/195-gpgcgassessment (accessed 16 Sept 2015). ↑ Clegg A, Young J, Iliffe S, Rikkert M, Rockwood K. Frailty in elderly people. Lancet (London, England). 2013 Feb 12 [cited 2016 Jan 27];9868(381). Available from: http://www.ncbi.nlm.nih.gov/pubmed/23395245. ↑ 19.0 19.1 19.2 19.3 19.4 Department Of Health. Emergency admissions to hospital: merging the demand. http://www.nao.org.uk/wp-content/uploads/2013/10/10288-001-Emergency-admissions.pdf (accessed 16 Oct 2015). ↑ 20.0 20.1 Royal College of Physicians. Hospitals on the edge: the time for action. London: RCP, 2012. ↑ 21.0 21.1 Cornwall J, Levenson R, Sonola L, Poteliakhoff E. Continuity of care for older hospital patients: a call for action. http://www.kingsfund.org.uk/sites/files/kf/field/field_publication_file/continuity-of-care-for-older-hospital-patients-mar-2012.pdf (accessed 16 Oct 2015). ↑ 22.0 22.1 Age UK. Later in life United Kingdom. http://www.ageuk.org.uk/Documents/EN-GB/Factsheets (accessed 16 Oct 2015). ↑ Organisation for Economic Co-operation and Development. Health at a Glance, 2013. http://www.oecdilibrary.org/docserver/download/8113161e.pdf?expires=1444911042checksum=AAD68253A0B959E184ACCEE3FFE37481 (accessed 16 Oct 2015). ↑ 24.0 24.1 Australia Institute of Health and Welfare. Australia’s hospitals 2013-14: at a glance http://www.aihw.gov.au/WorkArea/DownloadAsset.aspx?id=60129551482 (accessed 20 Dec 2015). ↑ 25.0 25.1 Weiss, A. J., And Elixhauser, A., 2014. Overview of Hospital Stays in the United States, 2012. Online from: http://www.hcup-us.ahrq.gov/reports/statbriefs/sb180-Hospitalizations-United-States-2012.jsp (accessed 4 Jan 2016). ↑ NHS Choices. Physiotherapy. http://www.nhs.uk/conditions/Physiotherapy/Pages/Introduction.aspx (accessed 20 Jan 2016). ↑ Chartered Society of Physiotherapy. Physio and paramedic pool resources in Lakes initiative. http://www.csp.org.uk/news/2015/10/12/physio-paramedic-pool-resources-lakes-initiative (accessed 20 Jan 2016). ↑ Department of Health. Common Assessment Framework for Adults: a consultation on proposals to improve information sharing around multi-disciplinary assessment and care planning. http://webarchive.nationalarchives.gov.uk/20130107105354/http://www.dh.gov.uk/en/Consultations/Closedconsultations/DH_093438 (accessed 4 Jan 2016). ↑ 40.0 40.1 Ellis G, Langhorne P. Comprehensive geriatric AX for older hospital patients. Bri Med Bull 2004; 71: 45-49. ↑ Sergi G, De Rui M, Sarti S, Manzato E. Polypharmacy in the elderly: can comprehensive geriatric assessment reduce inappropriate medication use? Drugs and aging 2011; 28(7):509. ↑ Tikkanen P, Lönnroos E, Sipilä S, Nykänen I, Sulkava R, Hartikainen S. Effects of comprehensive geriatric assessment-based individually targeted interventions on mobility of pre-frail and frail community-dwelling older people. Geriatrics Gerontology International 2015; 15(1): 80-88. ↑ Nikolaus T, Specht-Leible N, Bach M, Oster P and Schlierf G . A randomized trial of comprehensive geriatric assessment and home intervention in the care of hospitalized patients . Age Ageing 1999;28(6): 543-550. ↑ Barer D. Inpatient comprehensive geriatric assessment improves the likelihood of living at home at 12 months. ACP Journal Club; 2011; 155(6): 1. ↑ Frese T , Deutsch T, Keyser M, Sandholzer H. In-home preventive comprehensive geriatric assessment (CGA) reduces mortality—A randomized controlled trial. Archives of Gerontology and Geriatrics 2012;55(3): 639–644. ↑ Wyrko Z. Frailty at the front door. Clinical Medicine 2015; 15(4): 377–81. ↑ 48.0 48.1 48.2 48.3 48.4 48.5 48.6 Fairhall N, Sherrington C, Kurrle S E, Lord S R and Cameron I D. ICF participation restriction is common in frail, community-dwelling older people: an observational cross-sectional study. Physiotherapy [serial online]. 2011 [cited 2016 Jan 11]; 97(1):26-32. Available from: Wiley online library. ↑ Mohile SG, Velarde C, Hurria A, Magnuson A, Lowenstein L, Pandya C, O'Donovan A, Gorawara-Bhat R, Dale W. Geriatric assessment-guided care processes for older adults: A Delphi consensus of geriatric oncology experts. Journal of the National Comprehensive Cancer Network 2015; 13(9):1120-1130. ↑ 50.0 50.1 Baker L. 2015. Physiotherapy guidelines for management of people at risk of falling version 6. http://www.torbaycaretrust.nhs.uk/publications/TSDHC/Physio%20Guidelines%20for%20the%20Management%20of%20People%20at%20Risk%20of%20Falling.pdf (accessed 20 Dec 2015). ↑ 51.0 51.1 51.2 Stokes M. Physical management in neurological rehabilitation. 2nd ed. London: Elsevier mosby,2004. ↑ 52.0 52.1 52.2 BHPS. Assessment of falls risk in older people: Falls Risk Assessment Tool-FRAT. http://www.bhps.org.uk/falls/documents/FRATtool.pdf (accessed 16 Jan 2016). ↑ 53.0 53.1 Needle JJ, Petchey RP, Benson J, Scriven A, Lawrenson J, Hilari K. The allied health professions and health promotion: a systematic literature review and narrative synthesis. Final report. NIHR Service Delivery and Organisation programme;2011. ↑ Stubbs B, Brefka S, Denkinger MD. What Works to Prevent Falls in Community-Dwelling Older Adults? Umbrella Review of Meta-analyses of Randomized Controlled Trials. Physical therapy 2015; 95(8):1095-110. ↑ 55.0 55.1 Sherrington C, Tiedemann A. Physiotherapy in the prevention of falls in older people. Journal of Physiotherapy 2015; 61(2): 54–60. ↑ 57.0 57.1 57.2 57.3 57.4 Wagstaff P and Coakley D. Physiotherapy and the elderly patient. Kent: Croom Helm ltd, 1988. ↑ 58.0 58.1 58.2 Smyth L. Practical physiotherapy with older people. Chapman and Hall, 1990. ↑ 59.0 59.1 59.2 HAS. Physiotherapy-Preserving motor function in frail elderly people living at home. http://www.has-sante.fr/portail/upload/docs/application/pdf/physiotherapy_guidelines.pdf (accessed 11 Oct 2015). ↑ Podsiadlo D and Richardson S. The Timed “Up and Go”: A Test of Basic Functional Mobility for Frail Elderly Persons, Journal of the American Geriatrics Society 1991;39(2):142–148. ↑ 61.0 61.1 61.2 Farrell MK. Using functional assessment and screening tools with frail older adults. Topics in geriatric rehabilitation 2004;20(1):14-20. ↑ Schwenk M, Howe C, Saleh A, Mohler J, Grewal G, Armstrong D and Najafi B. Frailty and Technology: A Systematic Review of Gait Analysis in Those with Frailty. Gerontology 2014; 60(1): 79–89. ↑ 63.0 63.1 Sibley KM, Straus SE, Inness EL, Salbach NM, Jaglal SB. Clinical balance assessment: perceptions of commonly-used standardized measures and current practices among physiotherapists in Ontario, Canada. Implement Sci 2013; 8: 33. ↑ Sibley KM, Beauchamp MK, Van Ooteghem K, Straus SE, Jaglal SB. Using the systems framework for postural control to analyze the components of balance evaluated in standardized balance measures: a scoping review. Arch Phys Med Rehabil 2015;96(1):122-132. ↑ 65.0 65.1 Lin MR, Hwang HF, Hu MH, Wu HD, Wang YW, Huang FC. Psychometric comparisons of the timed up and go, one-leg stand, functional reach, and Tinetti balance measures in community-dwelling older people. J Am Geriatr Soc 2004;52(8):1343-8. ↑ Chkeir A, Jaber R , Hewson DJ , Duchêne J. Estimation of grip force using the Grip-ball dynamometer. Medical Engineering Physics 2013; 35(11):1698-1702. ↑ Chiacchiero M, Dresely B, Silva U, DeLosReyes R, Vorik B. The relationship between range of movement, flexibility, and balance in the elderly. Topics in Geriatric Rehabilitation 2010; 26(2): 148-155. ↑ 68.0 68.1 68.2 Millán-Calenti JC, Tubío J, Pita-Fernández S, González-Abraldes I, Lorenzo T, Fernández-Arruty T, Maseda A. Prevalence of functional disability in activities of daily living (ADL), instrumental activities of daily living (IADL) and associated factors, as predictors of morbidity and mortality. Archives of Gerontology and Geriatrics 2010; 50(3): 306–310. ↑ 69.0 69.1 69.2 Ward G, Jagger C and Harper W. A review of instrumental ADL assessments for use with elderly people. Reviews in Clinical Gerontology 1998; 8: 65-71. ↑ Jette DU et al.Use of Standardized Outcome Measures in Physical Therapist Practice: Perceptions and Applications. Physical therapy 2009; 89(2):125-35. ↑ Kyte DG, Calvert M. An introduction to patient-reported outcome measures (PROMs) in physiotherapy. Physiotherapy 2015; 101(2):119-25. http://www.ncbi.nlm.nih.gov/pubmed/25620440 (accessed 5 Jan 2016). ↑ Gloth FM, Walston J, Meyer J and Pearson J. Frail elderly functional assessment. American Journal of Physical Medicine and Rehabilitation 1995; 74(1): 45-53. ↑ Gloth FM, Walston J, Meyer J and Pearson J. The frail elderly functional assessment questionnaire: Its responsiveness and validity in alternative settings. Archives of Physical Medicine and Rehabilitation 1999; 80(12):1572–1576. ↑ Peters DM, Fritz SL, Krotish D. Assessing the Reliability and Validity of a Shorter Walk Test Compared With the 10-Meter Walk Test for Measurements of Gait Speed in Healthy, Older Adults. Journal of geriatric physical therapy 2001; 36(1). ↑ Leerar P J, Miller EW. Concurrent Validity of Distance-Walks and Timed-Walks in the Well-Elderly. Journal of Geriatric Physical Therapy 2002; 25(2): 3-7. ↑ 76.0 76.1 Rolfson DB, Majumdar SR, Tsuyuki RT, Tahir A and Rockwood K . Validity and reliability of the Edmonton Frail Scale. Age and aging 2006; 35(5):526-29. ↑ NHS. Prisma 7 questionnaire. https://www.england.nhs.uk/wp-content/uploads/2015/01/frlty-spec-tools-prisma.pdf (accessed 15 Nov 2015). ↑ 78.0 78.1 Hebert R, Durand PJ, Dubuc N, Tourigny A. Frail elderly patients: new model for integrated service delivery. Can Fam Physician 2003; 49: 992-997. ↑ Richards, S. H., Peters, T. J., et al. Inter-rater reliability of the Barthel ADL index: how does a researcher compare to a nurse? Clinical Rehabilitation 2000; 14(1): 72-78. ↑ Tinetti ME.Performance-oriented assessment of mobility problems in elderly patients. J Am Geriatr Soc 1986; 34(2): 119-126. ↑ Raiche M, Rejean H, Francois P, Corriveau H. Screening older adults at risk of falling with the Tinetti balance scale. The Lancet 2000; 356(9234):1001-1002. ↑ Thomas JI and Lane JV. A pilot study to explore the predictive validity of 4 measures of falls risk in frail elderly patients. Archives of Physical Medicine and Rehabilitation 2005; 86(8): 1636-1640. ↑ Faber MJ, Bosscher RJ et al. Clinimetric properties of the performance-oriented mobility assessment. Phys Ther 2006;86(7): 944-954. ↑ Vaniersel M, Benraad CM et al.Validity and reliability of quantitative gait analysis in geriatric patients with and without dementia. Journal of the American Geriatrics Society 2007; 55(4): 632-633. ↑ Smith R. Validation and Reliability of the Elderly Mobility Scale. Physiotherapy1994;80(11):744-747. ↑ Nolan J, Remilton L and Green M.The reliability and validity of the Elderly Mobility Scale in the acute hospital setting. Internet J Allied Health Sci Pract 2008;6(4). 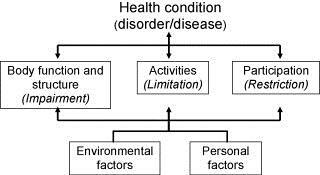 ↑ Morala D. Factors Associated with the Functional Status of Community-dwelling. Elderly Journal of Geriatric Physical Therapy 2006; 29(3). ↑ Deary IJ, Corley J, Gow AJ, Harris SE. Age-associated cognitive decline. Br Med Bull 2009; 92(1): 135-152. ↑ Albert SM, Tabert MH, Dienstag A, Pelton G, Devanand D. The impact of mild cognitive impairment on functional abilities in the elderly. Current Psychiatry Reports 2002; 4(1):64-68. ↑ 90.0 90.1 90.2 Theou O, Jones GR, Overend TJ, Kloseck M, and Vandervoort AA. An exploration of the association between frailty and muscle fatigue. Appl. Physiol. Nutr. Metab. 2008; 33: 651–665. http://www.researchgate.net/publication/51415786_An_exploration_of_the_association_between_frailty_and_muscle_fatigue (accessed 4 Jan 2016). ↑ MedlinePlus. Aging changes in body shape. https://www.nlm.nih.gov/medlineplus/ency/article/003998.htm (accessed 18 Jan 2016). ↑ Boskey AL, Coleman R. Aging and Bone. 2010; 89: 1333-1348. http://www.ncbi.nlm.nih.gov/pmc/articles/PMC2991386/ (accessed 18 Jan 2016). ↑ Nair KS. Aging muscle 1-5. 2005;81:953-63. http://ajcn.nutrition.org/content/81/5/953.long (accessed 19 Jan 2016). ↑ Glisky EL. Changes in Cognitive function in Human Aging. 2007. https://www.researchgate.net/publication/49727031_Changes_in_Cognitive_Function_in_Human_Aging (accessed 20 Jan 2016). ↑ NHS. Generalised anxiety disorder in adults - Treatment. http://www.nhs.uk/Conditions/Anxiety/Pages/Treatment.aspx (Accessed 3 Jan 2016). ↑ Mayo Clinic, Diseases and Conditions:High blood pressure (hypertension). http://www.mayoclinic.org/diseases-conditions/high-blood-pressure/in-depth/angiotensin-ii-receptor-blockers/art-20045009 (accessed 9 Jan 2016). ↑ Mayo Clinic, Diseases and Conditions: Diuretics. http://www.mayoclinic.org/diseases-conditions/high-blood-pressure/in-depth/diuretics/art-20048129 (Accessed 4 Jan 2016). ↑ Sullivan G and Lansbury G. Physiotherapists’ knowledge of their clients’ medications: A survey of practicing physiotherapists in New South Wales, Australia. 2009;15: 191-198. http://www.tandfonline.com/doi/pdf/10.1080/095939899307748 (accessed 18 Jan 2016). ↑ Age UK. Health and wellbeing: conditions and illnesses. http://www.ageuk.org.uk/health-wellbeing/conditions-illnesses/ (accessed 18 Jan 2016). ↑ Aging Society. Chronic Conditions – A challenge for the 21st century. http://www.agingsociety.org/agingsociety/pdf/chronic.pdf (accessed 21 Jan 2016). ↑ Jong MR, Elst MV and Hartholt KA. Drug-related falls in older patients: implicated drugs, consequences, and possible prevention strategies. 2013; 4(4): 147–154. Full version: http://www.ncbi.nlm.nih.gov/pmc/articles/PMC4125318/ (accessed 19 Jan 2016). ↑ BioMedCentral. Fall risk-increasing drugs and falls: a cross-sectional study among elderly patients in primary care http://bmcgeriatr.biomedcentral.com/articles/10.1186/1471-2318-14-40 (Accessed 20 Jan 2016). ↑ NHS Southern Health. Inpatient services - older people's mental health. http://www.southernhealth.nhs.uk/services/mental-health/older/inpatient/ (accessed 20 Jan 2016). ↑ Barberger-Gateau P, Fabrigoule C. Disability and cognitive impairment in the elderly. Disabil Rehabil 1997; 19: 5 :175-93. ↑ 116.0 116.1 National Institute for Health and Care Excellence. Delirium: prevention, diagnosis and management. London: National Institute for Health and Care Excellence, 2010. ↑ Kempanaar L. The Role of Physiotherapy in Dementia Rehabilitation. In: Marshall, M editor. Perspectives on Rehabilitation and Dementia. London: Jessica Kingsley Publishers, 2004. P91-8. ↑ Mental Health Foundation. Mental health statistics: older people. https://www.mentalhealth.org.uk/statistics/mental-health-statistics-older-people (accessed 20 Jan 2016). ↑ Fiske A, Wetherell JL, Gatz M. Depression in Older Adults. Annu Rev Clin Psychol 2009; 5: 363–89. ↑ Kirmizioglu Y, Dogan O, Kugu N, Akyuz G. Prevalence of anxiety disorders among elderly people. Int J Geriatr Psychiatry 2009;24:9:1026-33. ↑ Horowitz B P. Supporting community living through client-centered care. Occupational therapy in mental health; 2002 : 18(1). ↑ 132.0 132.1 World Health Organization. ICIDH-2: International classification of functioning, disability, and health. Geneva: World Health Organization, 2001. ↑ World Health Organisation. ICF Checklist version 2.1a clinicians. http://www.who.int/classifications/icf/icfchecklist.pdf?ua=1 (accessed 04 Jan 2016). ↑ Norton J, Ancelin ML, Stewart R, Berr C, Ritchie K, Carrière I. Anxiety symptoms and disorder predict activity limitations in the elderly. Journal of Affective Disorders 2012; 141(2/3): 276-285. ↑ 135.0 135.1 135.2 Nilsson I, Nyqvist F, Gustafson Y and Nygård M. Leisure Engagement: Medical Conditions, Mobility Difficulties, and Activity Limitations—A Later Life Perspective. Journal of Aging Research; 2015. http://dx.doi.org/10.1155/2015/610154 (accessed 04 Jan 2016). ↑ 136.0 136.1 136.2 136.3 136.4 Cambois E, Robine J-M, Romieu I. The influence of functional limitations and various demographic factors on self-reported activity restriction at older ages. Disability and Rehabilitation 2005; 27(15): 871 – 883. ↑ 137.0 137.1 Makizako H, Shimada H, Doi T, Tsutsumimoto K, Lee S, Hotta R, et al. Cognitive Functioning and Walking Speed in Older Adults as Predictors of Limitations in Self-Reported Instrumental Activity of Daily Living: Prospective Findings from the Obu Study of Health Promotion for the Elderly. Int. J. Environ. Res. Public Health 2015; 12: 3002-3013. www.mdpi.com/1660-4601/12/3/3002/pdf (accessed 20 Dec 2015). ↑ Qu W, Stineman, MG, Streim J E, Dawei Xie D. Understanding Linkages between Perceived Causative Impairment and Activity Limitations among Older People Living In the Community. A Population-Based Assessment. Am J Phys Med Rehabil. 2011; 90(6): 466–476. ↑ Mast BT, Azar AR, MacNeill SE, Lichtenberg PA. Depression and activities of daily living predict rehospitalization within 6 months of discharge from geriatric rehabilitation. Rehabilitation Psychology 2004; 49(3): 219-223. ↑ 140.0 140.1 Petty, NJ. Neuromusculoskeletal examination and assessment: a handbook for therapists. Edinburgh : Churchill Livingstone, 2011. ↑ Cott, CA. Goal setting. In: Pickles B et al, editor. Physiotherapy with older people. London: WB Saunders company ltd, 1995. ↑ 142.0 142.1 Arnadottir S A, Gunnarsdottir E D, Stenlund H and Lundin-olsson L. Participation frequency and perceived participation restrictions at older age: applying the International Classification of Functioning, Disability and Health (ICF) framework. Disability and rehabilitation 2011; 33(22-23): 2208-2216. ↑ Crews JE and Campbell VA. Health Conditions, Activity Limitations, and Participation Restrictions Among Older People with Visual Impairments. Journal of Visual Impairment and Blindness 2001; 95(8):453-467. ↑ Wilkie R, Peat G, Thomas E, Croft P. The prevalence of person-perceived participation restriction in community-dwelling older adults. Qual Life Res. 2006;15: 1471–1479. ↑ Wilkie R, Peat G, Thomas E, Croft P. Factors associated with restricted mobility outside the home in community-dwelling adults ages fifty years and older with knee pain: An example of use of the international classification of functioning to investigate participation restriction. Arthritis Care and Research. 2007; 57 (8): 1381-1389. ↑ Mearns N, Duguid I. Physiotherapy and Occupational Therapy in the Acute Medical Unit: Guidelines for Practice. http://www.acutemedicine.org.uk/wp-content/uploads/2015/05/10.2-PTOT-AMU-Guidance-Document-2015.pdf (accessed 13 Jan 2016). ↑ Philp I. A recipe for care – not a single ingredient. London: Department of Health, 2007. ↑ 151.0 151.1 151.2 Age UK. Stop Falling: Start Saving Lives and Money. London: Age UK, 2010. ↑ Scottish Government. Up and About or Falling Short? – A Report of the Findings of a Mapping of Services for Falls Prevention in Older People. Edinburgh: Scottish Government, 2012. ↑ World Health Organisation. WHO global report on falls prevention in older age. Geneva, Switzerland: World Health Organisation, 2007. ↑ Janssen I, Heymsfield SB, Ross R, et al. Low relative skeletal muscle mass (sarcopenia) in older persons is associated with functional impairment and physical disability. J Am Geriatr Soc 2002; 50; 889-96. ↑ Sousa AS, Guerra RS, Fonseca I, et al. Sarcopenia and length of hospital stay. Eur J Clin Nutr 2015. ↑ Rubenstein, LZ. Falls in older people: epidemiology, risk factors and strategies for prevention. Age and Ageing 2006; 35. ↑ El-Khoury F, Cassou B, Latouche A, et al. Effectiveness of two-year balance training programme on prevention of fall induced injuries in at risk women aged 75-85 living in community: Ossebo randomised controlled trial. BMJ 2015; 22. ↑ Fu AS, Gao KL, Tung AK, et al. 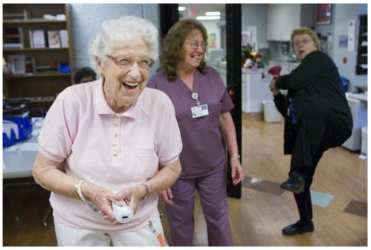 Effectiveness of exergaming training reducing risk and incidence of falls in frail older adults with a history of falls. Phys Med Rehabil 2015; 96; 2096-102. ↑ Kang JW, Lee MS, Posadzki P, et al. T’ai chi for the treatment of osteoarthritis: a systematic review and meta-analysis. BMJ Open 2009; 1. ↑ Tufts Health Plan Foundation. The Benefits of Tai Chi for Older Adults. https://www.youtube.com/watch?v=D-GFreeZTow (accessed 20 Jan 2016). ↑ Leeuw M, Goossens MEJB, Linton SJ, et al. The fear-avoidance model of musculoskeletal pain: Current state of scientific evidence. Journal of Behavioural Evidence 2007; 30; 77-94. ↑ West Lothian Council. Find Local Groups, Clubs and Societies. http://www.westlothian.gov.uk/localgroups (accessed 20 Jan 2016). ↑ 230.0 230.1 Maslow AH. Motivation and personality. London: Methuen, 1954. ↑ Thomas B, Storey E. [place unknown: publisher unknown]. Motivating the elderly client in long-term care; 2015 Dec 28 [cited 2016 Jan 8]. Available from: http://physical-therapy.advanceweb.com/Article/Motivating-the-Elderly-Client-in-Long-Term-Care.aspx. ↑ Rosenfeld M. Motivational Strategies in Geriatric Rehabilitation. Bethseda, MD: American Occupational Therapy Association; 1997.